RW Argentina: Nothing to Wine About! On August 18th, 14 new Boothies huddled around in O’Hare introducing themselves and doing their best to remember names. We were excited to eat and drink our way through Argentina, but were not prepared for all the adventures, jokes, and friendships that would form. Our adventure began when we landed in Buenos Aires and met our wonderful tour guide Patricia. Our first day was spent driving around the city visiting important sites like the Casa Rosada, the Catedral Metropolitana, La Boca neighborhood, and the Recoleta cemetery. The exhaustion from traveling overnight finally kicked in after lunch and the group went back to the hotel for a quick nap. As the sun set, we headed out to The Argentine Experience where we mixed cocktails, drank wine, made our own empanadas, drank mate’, and had a delicious steak dinner. We kept the night going by hopping around bars and immersing ourselves in Argentina’s nightlife. RW Argentina at the Argentine Experience, enjoying cocktails, wine, and steak before bar-hopping and soaking in the nightlife in Buenos Aires. 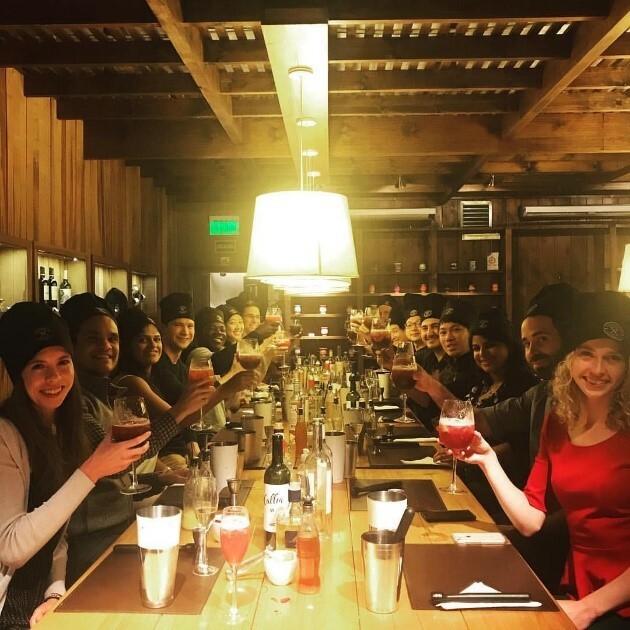 Despite a long night and slow morning, the group managed to make our 10 AM flight to Mendoza for a day of wine tastings and a 6-course lunch. I wish I could say we learned how to taste the fine oaky aromas of an aged Merlot with fruit forward flavors, but the group mostly just dared each other to drink daring concoctions. We followed up our cultured day with an adventurous hike in the Andes. We ignored the advice of TLC and decided to not only go chasing waterfalls, but rappel down them too. The final stretch of our journey brought us back to Buenos Aires where we decided to book a ferry and cross the river into Colonia, Uruguay for our free day. We learned about the city’s history, met some new people, and got interviewed by Chilean reporters for our golf cart rendition of the Kiki Challenge. After we returned to Buenos Aires we enjoyed the cities nightlife by dancing the night away. On our penultimate day in Argentina, we drove out into the countryside to do our best Gaucho impression. We rode horses, ate our weight in various meats, and enjoyed a traditional Argentinian dance show. Our group returned to the city for another night of dancing and recovered on our last day by shopping at the Galerias Pacifico, visiting El Ateneo (the 2nd most beautiful bookstore in the world), or just walking the streets and enjoying the city. Finally, to cap off our adventure in Argentina that night we enjoyed a three-course dinner and tango show. As I tried to remember the details of our trip to Argentina, what stood out the most were the friendships I made and the smiles I shared. I’m thrilled to begin this next chapter of my life with this group of guys and girls. Big thanks to our fearless leaders Nikhita Giridhar, JP Lauz, Leigh Terhaar, and Roi Kessler who made our trip unforgettable. Jon’s a first-year from Denver who has now added ‘empanada-chef’ to his list of skills.